Staff at Milan's world-famous La Scala opera house have overwhelmingly called for the resignation of their renowned musical director, Riccardo Muti. More than 700 orchestra members and staff voted against Mr Muti following weeks of conflict over the dismissal of a senior La Scala official. La Scala denied reports that Mr Muti - who has been at the opera house for 20 years - had already resigned. Earlier this week, Mr Muti cancelled a concert because of the rifts. He said it was impossible to "make music together considering the atmosphere created by the insinuations, the insults and the incomprehension". In Wednesday's no-confidence vote, only two members of staff supported the maestro. 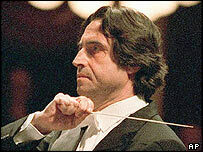 "The relationship between Muti and the orchestra is sick. We're like a separated husband and wife bickering," flautist Davide Formisano said after a union meeting. Concern among staff was prompted by the sacking last month of Carlo Fontana - who had headed the theatre since 1990. The theatre board cited "differences" with Mr Muti. Mr Fontana was succeeded by Mauro Meli, whose resignation staff are also demanding, the union officials said. Italy's Culture Minister, Giuliano Urbani, has given his support to the conductor. He called on all parties to try to resolve the issues "while doing their best to safeguard the prestige and history of this theatre that knows no equal."